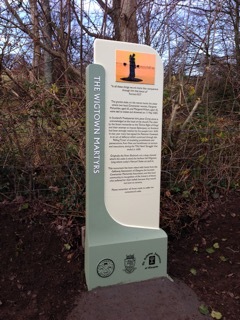 The granite stake on the merse marks the place where two local Covenanter women, Margaret McLachlan, aged 63, and Margaret Wilson, aged 18, were tied to stakes and drowned on 11 May 1685. In Scotland's Presbyterian kirk, Jesus Christ alone is acknowledged as the head of the church. The claim by the Stuart monarchs to the ‘Divine Right of Kings’ and their attempt to impose Episcopacy on Scotland had been strongly resisted by the people from 1638. In that year many had signed the National Covenant in an act of defiance which continued through the ‘Killing Times of escalating punishments and persecutions, from fines and banishment to torture and executions, during the ‘Fifty Years’ Struggle’ that ended in 1688. Originally the River Bladnoch cut a deep channel where the stake is sited, the harbour for Wigtown lying where today’s Martyrs’ Stake car park is. This monument has been raised with funds from the Galloway Association of Glasgow, the Scottish Covenanter Memorials Association, and the local community, in recognition of the bravery of those who suffered for their beliefs because they would not bow to tyranny. Please remember all those who have.